Chrome and polished aluminum wheels look great, but require just a little extra effort to protect that factory finish and shine. Painted and clear coated custom wheels are more forgiving, but should still be handled with care to protect your investment. For all wheels, a simple hand washing with a mild dish soap and water will clean them up nicely. Dry thoroughly and finish with a soft nonabrasive cream wax to protect the wheel. Keep in mind that you should never wash a wheel when it is hot. Spraying cold water on your wheels when they are very hot can cause rapid contraction resulting in slight warping as well as stresses between different materials like chrome and underlying steel or aluminum. Over time, these shocks to the wheel can cause the chrome to begin flaking. Also avoid abrasive materials like bristle brushes and steel wool that can permanently scratch your wheels. Plus, always keep harsh cleaners including tire cleaners from coming into to contact with your wheels and damaging the finish. Washing your custom wheels once a week will keep road grime and brake dust from being ground on. When brake dust and other road dirt accumulate they will trap salts and moisture in the air that can react with chrome and aluminum finishes causing oxidation and pitting. Avoid frequently using commercial car washes whose equipment could scratch your wheels and whose detergents are often very harsh. Also carefully check the label before using any wheel brake dust cleaner — many are too acidic to use on chromed wheels. Winter weather and snow should be avoided at all cost. Corrosive salt and abrasive sand will wreak havoc on any finish. Put your factory wheels on for winter driving and save your custom wheels for the prime cruising weather. When in doubt as to how to clean and protect your custom wheels, the products you use to clean and protect the body of your car can usually be used safely. But as always, take a minute to read the labels for any warnings. Damage from curbs and other objects are unsightly, but usually not a real safety concern. On painted wheels a touch-up may be possible with matching paint ordered from the manufacturer. Scratches on aluminum may be buffed out if not too deep. But there is no real fix for scratched chrome. 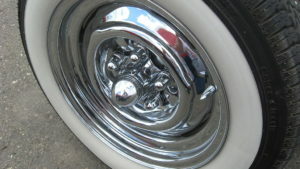 If you curb your chrome wheels, immediately apply a clear lacquer, like clear nail polish to reseal the chrome. After that has dried, also apply a light coat of non-abrasive cream wax. This should keep any moisture from getting underneath the chrome and causing it bubble up or peel away from the underlying wheel. These days, most of us live not far from a large local tire retailer who stocks a big selection of custom wheels. Get to know them. They can steer you toward the right products for your particular type of wheel. They also talk to hundreds of car customizers every month, so often they can even recommend a local car wash that you can trust not to scratch your wheels or use harsh detergents. Custom wheels are an investment in the look and character of your vehicle. And like all investments, they need to be protected. People have trusted Belle Tire for the best value since 1922. For the lowest tire prices, period, and great low prices on custom wheels, alignments, brakes, batteries, oil and lube, shocks and struts, windshield repair and replacement, and more, visit www.belletire.com. Also join our online communities: BELLE TIRE CARES BLOG, FACEBOOK, and TWITTERGreg Roy is an advertising and social media copywriter with over 20 years experience –specializing in creating messages that not only get clients noticed, but also bring them desired results.